You may play this spell when an opponent would use a spell, ability, or dice power that targets a unit you control. Cancel the effects of that spell, ability, or dice power. 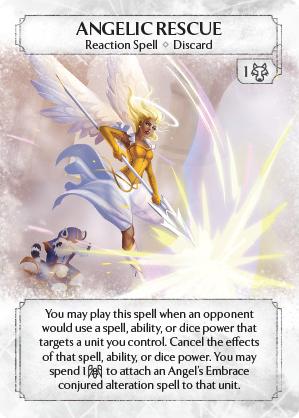 You may spend 1 [[divine:class]] to attach an Angel's Embrace conjured alteration spell to that unit.